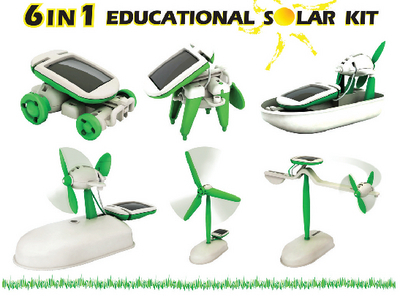 This mini solar building kit provides for a hands-on learning experience as students experience firsthand the benefits of solar energy while building models that require no batteries. Designed to teach how solar power is used to drive a small motor, this construction set features 21 snap together parts to build six different working models. Note: Tools are not required to build an airboat, windmill, puppy, and two different planes. Caution: WARNING: CHOKING HAZARD–Small Parts. Not for children under 3 yrs.